Soon a number of other similar heads were discovered, the largest eleven feet tall, and each weighing from six to nearly fifty tons. These turned out to be the artistic creations of the oldest civilization in the Americas – the Olmecs – that lasted from about 1600 BC to 350 BC. The heads apparently represent their rulers who cannot be accused of modesty. One mystery is how these giant stones were moved from far-off mountains to their resting place since Olmecs didn’t have the wheel. They had much else according to clues that have been put together. They planted various crops, developed a rudimentary system of writing and mathematics, studied astronomy and produced a calendar. Why they disappeared remains a mystery, but their very wet region may have reclaimed the land. Where did they come from? – the biggest mystery of all for which many conflicting explanations have been given. A leading contender is Africa. There are facial similarities in the stones, and Olmec writings resemble a West African script. Many Africans of the time were seafarers. Some quite possibly reached Americas’ shores. Supporters of this theory note that Greeks, Phoenicians and others were crowding the regional sea routes and thus pushing Africans further west to a new land and civilization that antedated Aztecs, Incas and Europeans. Here was a black empire created on its own, no help needed. A bit too Afrocentric, say partisans of other cultures. Records appear to show that around the time of the Olmecs, the Chinese emperor ordered 25 thousand seamen out to the Pacific. 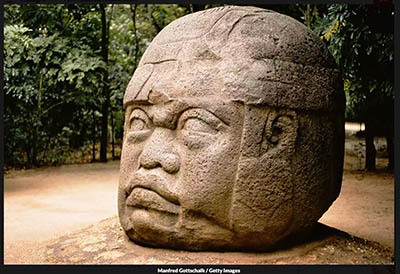 Words written on Olmec heads and other artifacts resemble Chinese ones. such as sun, water, rain, earth, sacrifice. Human sacrifice, to be sure, was prominent in most ancient cultures. But wait. Other scholars discern signs of Japanese influence in the pottery of the Olmec region, and Japanese fishermen managed to sail to the area. A genetic study has revealed a clear link to East Asia, whose genes may have been competing with others in that first empire. Wherever the truth lies, the imposing Olmec face is both a reminder of a forgotten past and a portrait of what’s to come in Americas’ future.